This comic is a bit late because it comes from the future! Also, I will be occupied with a secret mystery project next week, so the next (new) Optipess comic will arrive April 1, which is no joke! Oh, and hints to said project will definitely be dropped for supporters on my Patreon page soon! Once we leave Earth for a couple of centuries, it can heal itself pretty fast. 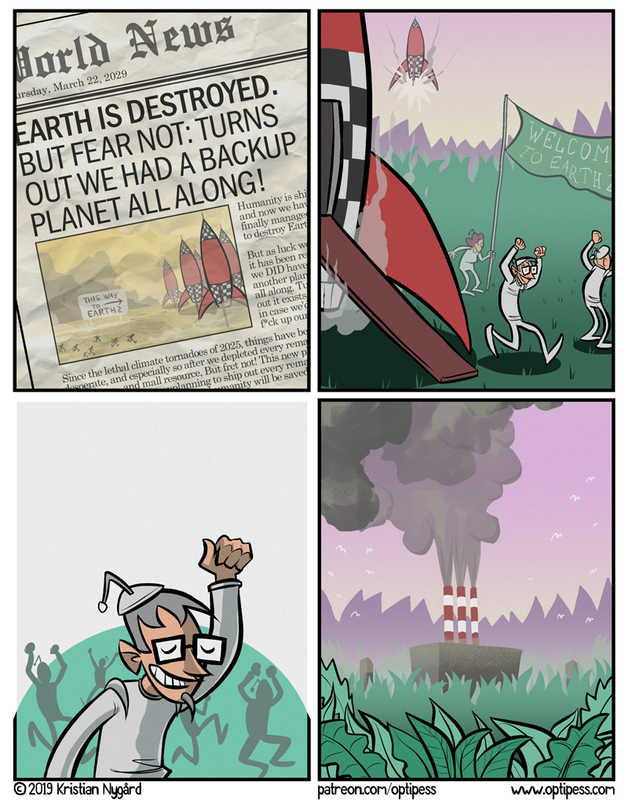 We can just jump back and forth from the two planets, humanity is saved! Also I don’t think everyone will be allowed to go to Earth 2. Just the “important” people, and the people they need to keep their easy lives going. The rest of us are expected to die off. We can only hope that Earth 2 will be an Old One/Outer God the size of a planet that ends up eating all the people or mentally enslaving them, forcing them to mutilate and sacrifice each other. At least that will give the rest of us some solace.